China has offered its support to eurozone countries to help them through the debt crisis that has gripped the region. "We are ready to support the eurozone to overcome the financial crisis and realise economic recovery," said foreign ministry spokeswoman Jiang Yu. She added that the eurozone would become "a major market" for China's foreign exchange investments. Some eurozone countries are struggling with high debt levels. The International Monetary Fund (IMF), along with the European Union (EU), has pledged tens of billions of dollars to bail out Greece and the Irish Republic. Earlier this year, Greece accepted a 110bn-euro aid package, while the Irish were forced to ask for an 85bn-euro package last month. There are fears that Portugal may also have to ask for assistance, while some commentators have even suggested that Spain may need help. China has massive reserves of foreign currency, predominantly in US dollars. 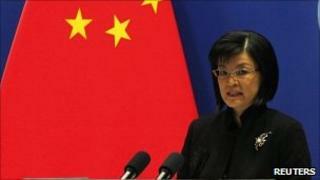 Ms Jiang's comments suggest that the country will buy more euros in the future. Earlier this week, China's Vice-Premier Wang Qishan said he supported the efforts of both the IMF and EU in providing assistance to struggling eurozone countries.